Truly Grass Fed Protein Blend (Whey Protein Isolate 91%, Milk Protein 9%), Organic Cocoa, Organic Creamer Flavor, Organic Erythritol, Organic Chocolate Flavor, Organic Chocolate Flavor, Sea Salt, Sunflower Lecithin, Organic Stevia Extract (leaf), 2 Billion CFU Bifidobacterium lactis BI-04. Truly Grass Fed Protein Blend (Whey Protein Isolate 85%, Milk Protein 15%), Organic Tapioca Fiber (IMO), Organic Vanilla Flavors, Organic Gum Acacia, Organic Erythritol, Sea Salt, Sunflower Lecithin, Organic Stevia Extract (leaf), 2 Billion CFU Bifidobacterium lactis BI-04. Non-GMO Project Verified Truly grass fed whey! 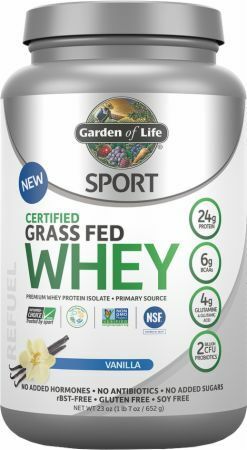 Sport Grass Fed Whey is certified “Truly” Grass Fed, ensuring the highest quality whey free of antibiotics and the hormones rBST, rBGH.